At 8:18am on Tuesday December 18, 2018, Victor – our guide – made the call. We were turning around at 6390m. “Team A” (Chris, Fraser – a young Aussie guy – and I) had left Camp Two at 2am, an hour before everyone else, trudging in the darkness for over six hours. Even when the sun came up it was little consolation – it was overcast and we had been battered by wind and snow showers. Now we were huddled inside a broken down hut known as Independencia at around 6390m, the wind howling around us, waiting for the promised break in the weather that had been the whole reason for this summit push in the first place. All that waiting in base camp and it seemed like we’d picked the worst night to set off. After forty-five minutes of huddling against the wind, eyelashes frozen (my goggles were so frozen I couldn’t see out of them), fingers and faces getting very cold, Victor had had enough. He made the call. We had watched two other major commercial, highly experienced teams do the same thing, turn around at Independencia, the only people forging on two Russian guides with no clients. Chris and I were disappointed, of course. Despite the long night hike (and the hike up to Camp Two the day before), we were feeling strong. And there wasn’t likely to be another attempt. But we had to trust in the judgement of our guide, so we crawled out of the hut and made our way back down the mountain. About ten minutes downhill however, we came across the second half of the team. The other two guides weren’t so sure about the decision to turn around, so we went back up to where the hut was situated as a whole group. Another team was up there – they were taking a final group picture to signal the end of their trek. But clearly Nims thought we were made of sterner stuff. We pretty much all had giant summit suits, down mitts and big triple layer boots – so frostbite wasn’t so much of a concern. Only our endurance. And now that the three guides were together, the decision was made to press on, relying on that hoped for weather window. Bit of a rollercoaster of emotions for us!! The first hour after choosing to continue was beyond miserable. Nims guesses the winds might have hit 90+km/hr as we traversed the mountain; thankfully Mingma David Sherpa (another of our guides) gave me his goggles so I could protect my face and eyes. It really seemed like the mountain was against us. Even the snow poles seemed to groan as we pressed on ever higher. But then, as we headed toward midday, we did get that lucky break. The sun came out, the winds died down and the views over the Andes were absolutely spectacular. Already, we were higher than almost every other peak we could see in the distance. This is what we had come for. Incredible. 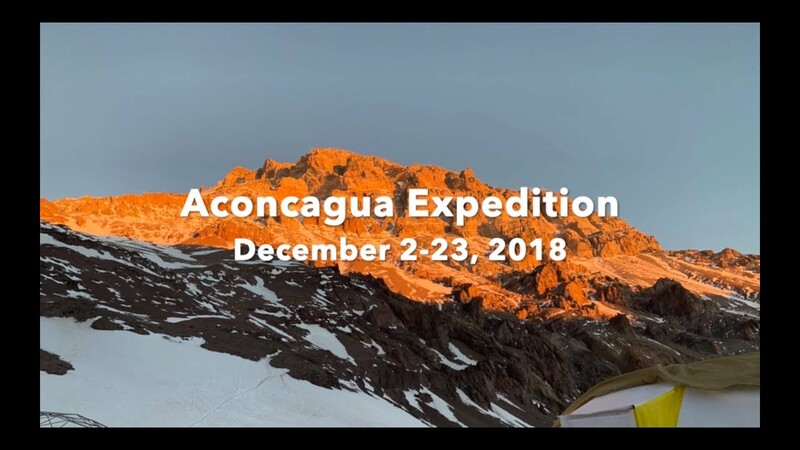 Now, I’d done my fair share of reading about Aconcagua before coming out here (basically I’ve read every blog and trip report on the internet!) so I knew perhaps the worst was to come. Just before the summit is an intimidating slope known as the “Canaleta” – a steep jumble of rock and scree that is the final hurdle to cross before reaching the summit. The hardest part right before the end – who on earth designed that? We took a long break at “la cueva”, a big cave with lots of nice rocks to sit and rest on. I sucked down an energy gel – from here, the summit looked tantalisingly close but there was still a good two hours of hard effort to go. We could see the two Russian guides ahead of us – they were about halfway up. Now, it was our turn. Is it always hardest right before the end? I mean, I’d found it pretty hard at about 4am, in the dark, only two hours in and knowing there was at least 10 more to go, with Victor shouting, “Daniela, you have to push!” And me replying, “My name is Amy and I CAAAAAN’T”. Still, that Canaleta pushed us all right to our limits. The altitude now was approaching 7000m so the air was paper thin, each lungful a struggle, each step a hardship. Chris and I alternated in pushing each other forward, knowing that the end was so close but also that we were totally depleted – a whole day of walking on half an expedition breakfast (which I almost threw up), three Dairy Milk bars and two energy gels not quite fuel enough. For the most part, I was pace setting (being the slowest), so Nims would nip ahead, making every step look easy, and I would follow laboriously behind. But eventually, three big rock scrambles later, and there we were! The summit! We’d made it against all the odds and in the most extreme of conditions. I burst into tears – it was emotional. 6962m. The highest point in the Western and Southern Hemispheres. One of the Seven Summits. The highest mountain outside the Himalayas. And the hardest experience I have ever, ever put myself through. Yay! Photographs and flags and hugs and celebrations all round. We’d arrived just before 2pm so almost a full twelve hours after starting out from Camp two. 1600m of elevation gain. It felt truly epic. But now we had to get back down again. Getting back down is no joke. It seemed to take us forever to pick our way down the Canaleta, and the decision was made to short rope the entire group for the rest of the journey to Camp Two. Another new mountaineering experience! The weather had turned on us again and the conditions were almost white out. The idea had been to get back down all the way to basecamp but the team was beyond depleted – Camp Two and a sleeping bag would be good enough. Somehow, after getting minorly lost and coming off the short rope, half-sliding down on my bum and watching a stunning final sunset, we made it to Camp Two. It was 9pm. The whole summit day had been twenty hours. Twenty hours of non-stop walking, barely any eating, and not a single bathroom break! To say I’m now dehydrated is an understatement. But we did it. We made it to the summit of Aconcagua. I wish I could say that was our struggles over! I’m currently writing this huddled in our three man tent at Camp Two the morning after, waiting for another weather break so we can get outta here and down to basecamp and out to Mendoza! Aconcagua, let us go!! Get us to Mendoza as fast as possible – a juicy Argentinian steak and a nice glass of Torrontes is calling my name. Who knew that “rest days” could be so frustrating? It’s the weather. It appeared that a window was going to open up on Sunday but soon, 60+ km p/hr winds were in the forecast. Now, it looks like Tuesday 18th is going to be the attempt – fingers crossed, the weather looks much better, the wind calmer, the skies bright and clear. We just need to have patience and wait for it. That being said, many other teams headed up the mountain a few nights ago – only to return this morning, some via helicopter. Only 3 people have summited this entire season. The winds were brutal last night, and even in our 10-person dorm, the wind battered and shook our tent until the door fell off (repeat this about seven times, until we had to rope the door shut!). I can’t imagine what it would be like at Camp 2, 1000m higher. I’m glad we’re safe and relatively comfortable down here. So I thought a little blog about what base camp life is like might be interesting to those at home! Plaza de Mulas is not a beautiful place – there are exceptions, like when the sun sets and paints the rock around us in a rosey hue, or in the dead of night when the skies are filled with more stars than I have ever seen. However, during the day, it’s a bit like living on top of a big quarry – dusty, rocky, sparse – nothing green for miles. Long drop toilets stand like sentries at the edge of the valley, which drops down to a small lake and then rises up again to the eerie site of an abandoned hotel. Chris and I are walking over there today to stretch our legs – others have come back with reports of menus still laid out on tables, flags hung on the walls, books on shelves – as if the inhabitants of the hotel just walked out one day and left. Calling Michelle Paver – I might just have found the site of your next remote ghost story. Lunch and dinner starts always with a bowl of the same virtually tasteless vegetable soup (improved with chilli sauce and another necessary way of ingesting fluids). This is Argentina though, so we’ve been treated to a couple of delicious asados (barbecues) with round after round of delicious meat. Not going to lie, I’m looking forward to a huge plate of broccoli on my return! But the staff here do a great job of making sure we’re kept full and healthy on a mountain diet. Harder to deal with are the extremes in temperature – from boiling hot in a sun-baked tent to freezing cold if the sun disappears. When boredom sets in, we read (I read A Lot!) or play cards (I haven’t played that many rounds of President since high school), or nap or take a stroll. By 9pm, we’re snug as bugs in our sleeping bags and praying we don’t have to go to the bathroom too many times in the night. Does it sound like a hard life? Probably not, but it’s amazing how quickly frustration sets in. Still, all the decisions that have been made have absolutely been the right ones, and we are at the mercy of the mountain. For me, I can’t help the anxiety and anticipation that grows every moment I stop and stare up at the summit of the mountain, knowing that despite all the rest days, one day soon I’ll be waking up and climbing that huge Stone Sentinel once again. So I’m trying to enjoy and make use of the rest days as much as possible, practicing patience and storing up as much hydration and energy as possible. Because before too long, I’m going to need every ounce of energy I’ve got.